Colorectal cancer is the fourth most common cancer in the United States. According to the U.S. Department of Health and Human Services, “if everyone age 50 and older were screened regularly, six out of 10 deaths from colorectal cancer could be prevented. Communities, health professionals, and families can work together to encourage people to get screened.” Read the ABIM Foundation’s Choosing Wisely® resources and discuss whether you might need a colonoscopy with your doctor. In honor of Colorectal Cancer Awareness Month, meet Dr. Rajeev Jain, a gastroenterologist and a member of the American Board of Internal Medicine (ABIM) Board of Directors. Dr. Jain is a partner at Texas Digestive Disease Consultants and is certified in Gastroenterology. He lives in Dallas, Texas. I aspired to be in a profession where I could impact people’s lives in a direct manner. One of the proudest moments in my career was when I received the teaching award by the interns and residents of Texas Health Presbyterian in 2003. When you talk to others about the work you do, what story do you like to tell? I like telling the story of how Katie Couric underwent a colonoscopy on national television to raise the importance of preventative colon cancer screening to the general public. She also demonstrated how easy it was to undergo the procedure which helped to defuse some of the anxiety associated with it. After her story aired, many more people underwent colon cancer screenings. A misconception is that doctors don’t like patients to ask questions. I believe a well-informed patient with questions about their diagnosis or planned treatment leads to a more meaningful doctor-patient relationship. The reason I wanted to serve on ABIM governance is to ensure that our programs are aligned with the complexities facing today’s medical community. I believe I am one of many who serve to provide the perspective of a busy, private practice clinician. 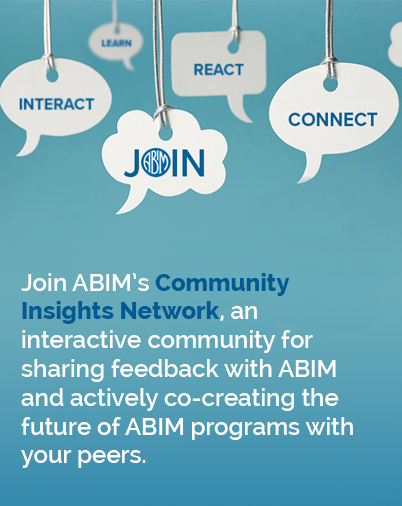 What did you learn about ABIM after joining a board/committee? The best thing about serving is learning from others. After joining, I met board and committee members who are passionate about medical professionalism. ABIM certifies one out of every four U.S. physicians. I would encourage others to join ABIM governance because it is rewarding in that it allows you to participate in the policy making that ultimately leads to pride in our professional certification.